Uruguay has rejected a request for asylum by Peru's former president, Alan García. Mr García entered the residence of the Uruguayan ambassador in Lima on 17 November after he was accused of taking bribes from Brazilian construction giant Odebrecht, which he denies. He has been staying there while Uruguay weighed his request. Uruguay said there were no grounds for asylum as "the three branches of the state function freely" in Peru. The announcement was made by Uruguay's President Tabaré Vásquez, who rejected Mr García's argument that he was the victim of political persecution. The Peruvian foreign minister, Néstor Popolizio, told local media Mr García had left the Uruguayan residence. It is not clear where he currently is. A court banned him from leaving Peru last month. Mr García served two terms as president, from 1985 to 1990 and from 2006 to 2011. Investigators allege he took kickbacks from Odebrecht during his second term in office. The allegations are linked to the construction of a metro line in the capital, Lima. Odebrecht has admitted paying almost $30m (£23.6m) in bribes in Peru since 2004 and is said to be close to reaching a formal plea deal. 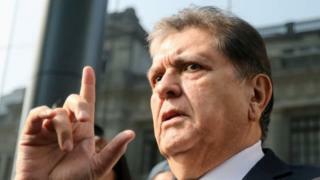 Mr García is the latest former Peruvian leader to become embroiled in a corruption scandal. The four most recent Peruvian presidents are all being investigated for alleged corruption, with a fifth - Alberto Fujimori - having been jailed for corruption and human rights abuses. According to an opinion poll conducted by pollsters Datum, Peruvians are more fed up than ever with endemic corruption. In October, 94% said they thought the level of corruption was either high or very high. President Martín Vizcarra, who took up office after Mr Kuczynski resigned, has said he will make the fight against corruption his priority. On Sunday, Peruvians will be called to vote in a referendum on five key reforms aimed at cleaning up Peruvian politics.